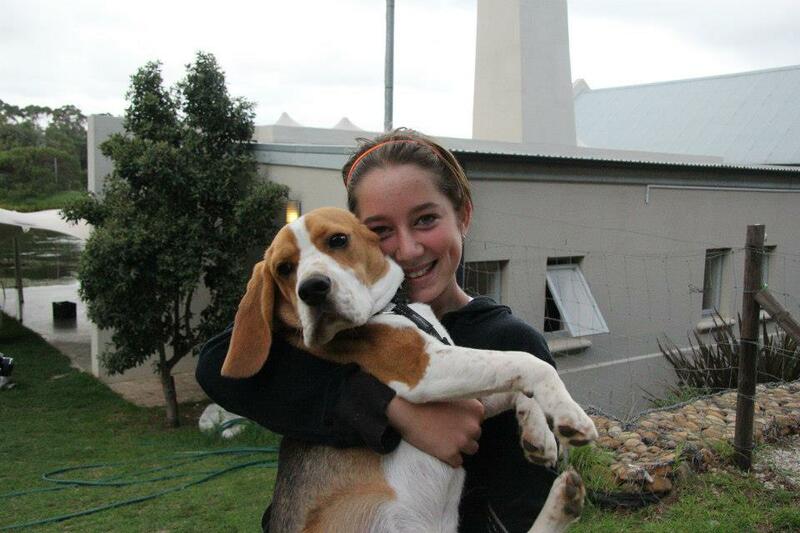 Animal Rescue Organisation – Cape Town – From the desk of the PR & Fundraising department. Here we will share upcoming events, challenges we face and what keeps us going. 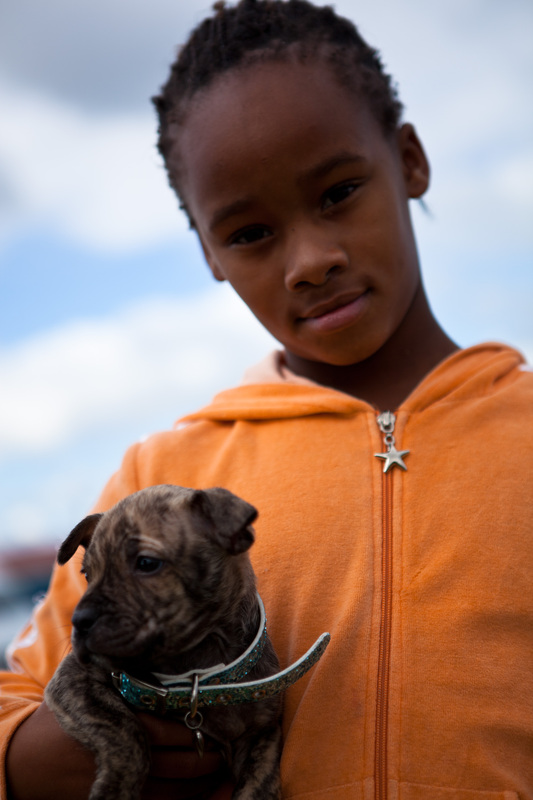 A “shoot from the hip” account of work at a clinic for animals in Manenberg, Cape Town, South Africa. Avril and I arrived at around10am in Manenberg at the People’s Centre in Stormsriver Way ready for our fortnightly helping hand at ARO’s clinic. We had not even parked our bakkie properly in the little bit of shade available, when a small child (about 8 years old) approached us with a puppy in a cardboard box and asked us to “put away” ie: put down. There were no further explanations, but we noted that puppy was in a pitiful state and was clearly dehydrated and malnourished. Dying. All these little souls handed in are taken to the Mobile Clinic and are assessed by ARO’s AWA first. It was 32degrees that day and before long, another puppy was brought to the clinic for the same reason. There was an unusually high number of children present (no doubt being school holidays). No less than five arrived each bearing a puppy! Some of them just wanted dip and deworm, which gave us a wonderful opportunity to educate these kids about pet care. The pups were too young to dip, but did receive flea powder and some syrup for de-worming and everyone was asked to bring their puppies back in a month’s time. We also told them of the Animal Welfare Society in Phillippi where they could take their puppies as this facility is closer than ARO. Young and old, desperately poor, the people came streaming in. Some with big dogs, most of which were terrified of the dipping bath procedure. I tried to explain to the people, that talking gently to the dog whilst restraining it was far better than shouting – or, as I witnessed on one occasion – kicking the dog into submission! After a clinic in Manenberg, I smell like an antiseptic bottle! But it also helps that I hold the dogs while the owners bath them, it makes the whole job easier and quicker. One child even wanted to dip his terrified cat! Hearing these things is a reality check that we must teach children (and adults) about pet care as it is clear that ignorance causes terrible suffering to these desperate animals. Sadly, the usual amount of unwanted, unloved and starving kittens (together with two terrified adult cats) also came to us to be “put away”. Sadly, the whole group of kittens were sick and so it was kindest to put them out of their terrified misery. We tried so hard to explain why dogs or cats should be sterilised – all these unwanted puppies and kittens. Our words fall on deaf ears. If there were By Laws enforcing sterilisation, we would be targeted and be in danger, our vehicles set alight no doubt and our staff’s lives put at risk. We have had threats to our staff before, and it is to be taken seriously. We cannot force people into what they do not want to do. Almost without exception, the adults refused to have their male or female dogs sterilised. They wanted a litter first or wanted to keep them for fighting purposes (not admitted to, but well known as a reality), which obviously is a lucrative money making business. It is very hard to keep one’s cool at these clinics when you witness abuse and heavy handedness with animals! I physically had to stop myself going for one man who mistreated his dog. Everyone pleads poverty. Not even a R2 to dip the dogs. The attitude of entitlement and a Government handout (they often think ARO is a Government service!) is rife and makes teaching responsibility very heavy going. As always, they were asked to contribute whatever they could – we live in eternal hope! Where does the money come from for the cigarettes and cellphones, I wonder to myself. A box of kittens were literally starving to death, sickly and dying from starvation, having been deprived of their mother’s milk for some days (she being too sick to have any for her family) and/or they were far too young to be separated! We couldn’t wait to leave at noon feeling very depressed and the sound of 14 kittens and 2 puppies’ crying in our ears nearly had us in tears as well. Two hours of hard work! Some may have been put down, but they are out of the hell, in a better place at least, not left to starve or be run over, used as bait for fighting or further abuse. But next week, we will see the same again, more desperate little faces, miserable lives, abused and suffering. Education is the key point. Provision of welfare level clinics is also essential and for this ARO has done an amazing job. Some of the children were pretty impoverished as well, to say the least. At least two were high on some “substance”. 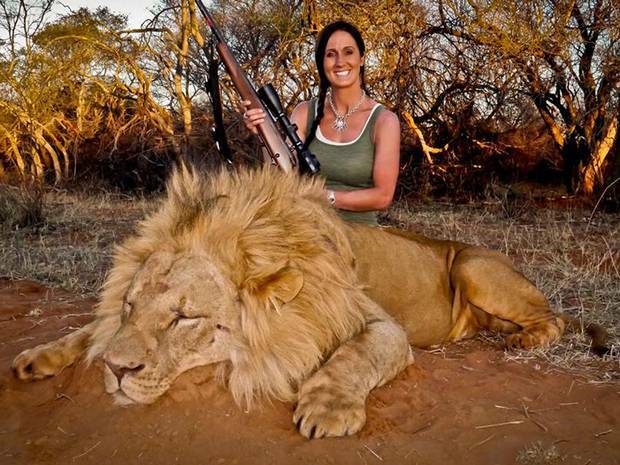 With all of this going on, the animals don’t stand much chance. On a happier note (don’t we all love happy endings?) we are investigating more education at the Manenburg People’s Centre (for the children (and the adults), perhaps introducing another welfare agency into the area as our twice a month ARO visit is not sufficient; and hopefully a dipping morning on a Saturday as being at least part of the whole solution. Wish us luck and please keep the funds rolling in to help all those so desperately in dire need. Well this is it, my last official blog as Communications and Events Coordinator of the Animal Rescue Organisation. Although my leaving is bittersweet, I leave with excitement, knowing that ARO has entered the online world and will continue to flourish here. It is with pleasure that I introduce, Karen De Klerk as new editor to the blog. My job has been tremendously rewarding. I have met and worked with many terrific people, and learned a great deal about fundraising, NPO’s and Communications. It has been a great experience and one which will always be close to my heart – the welfare of those that cannot speak for themselves. I particularly want to thank Karen (head of fundraising), who provided me with this wonderful opportunity who has willing shared her knowledge and expertise in fundraising with me. Also to the rest of the AROTeam – what a compassionate and driven bunch of individuals you are! Finally, I want to thank you, the friends, followers and supporters, for being out there, making it possible for ARO to continue providing the many animals with the care they so justly deserve. This is not goodbye, as I am sure to see you at the many ARO events and other doggy do’s! 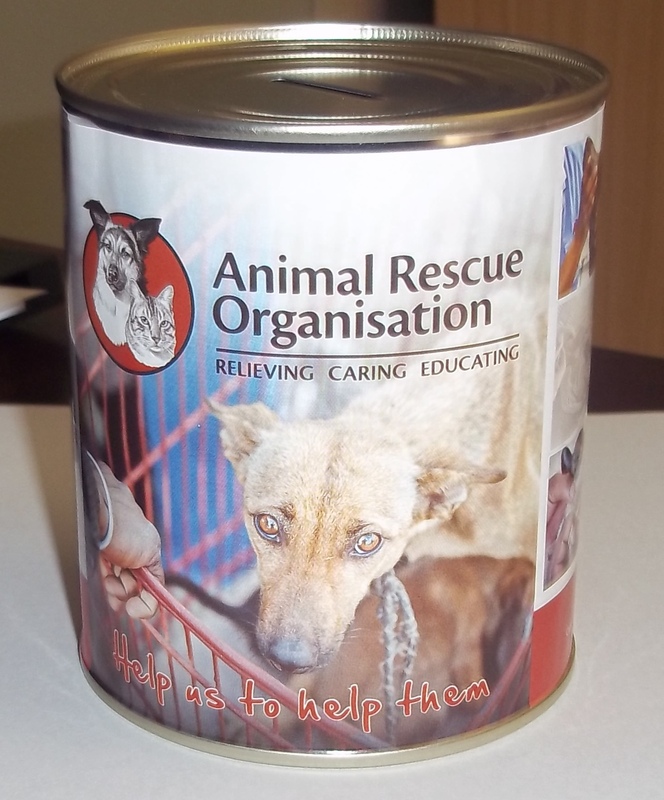 The Animal Rescue Organisation is losing out on hundreds of rands in donations due to collection tins, being stolen from shop counters or individuals posing as staff members and removing tins. A snapshot of a suspected thief, who has been seen in the Helderberg area is on file and has been given to all shop managers in the vicinity. We have over a thousand tins situated on shop counters in and around the Cape Metropole, and they bring in over R12 000 per month, this is a significant amount and one which assists ARO greatly. Despite the recent thefts, members of public wanting to donate / place money in the tins should not hesitate, we are keeping a close eye on all our tins and it is now compulsory that each tin is secured to the shop counter by chain and only persons with an ID card may collect a tin. I am not posting this article to put the public off donating via our collection tins, as it is a vital part of our monthly income, however, we are appealing to all shop owners and employees to be more vigilant. Shop owners and employees are to request identification from the person removing a tin, especially if they do not provide a replacement tin. I would like to thank all the outlets that allow us to place our collection tins on their counters, it is greatly appreciated, and all the small change is making a BIG difference. If you have any further information or to request a collection tin be placed in your shop, kindly contact the Animal Rescue Organisation on 021 396 5511. With the extreme temperatures and heat we have been experiencing recently, It had me thinking about the effects it has on our pets. Both myself and the Animal Rescue Organisation is appealing to pet owners to ensure your animals have access to plenty of fresh, clean water and shelter that provides shade. 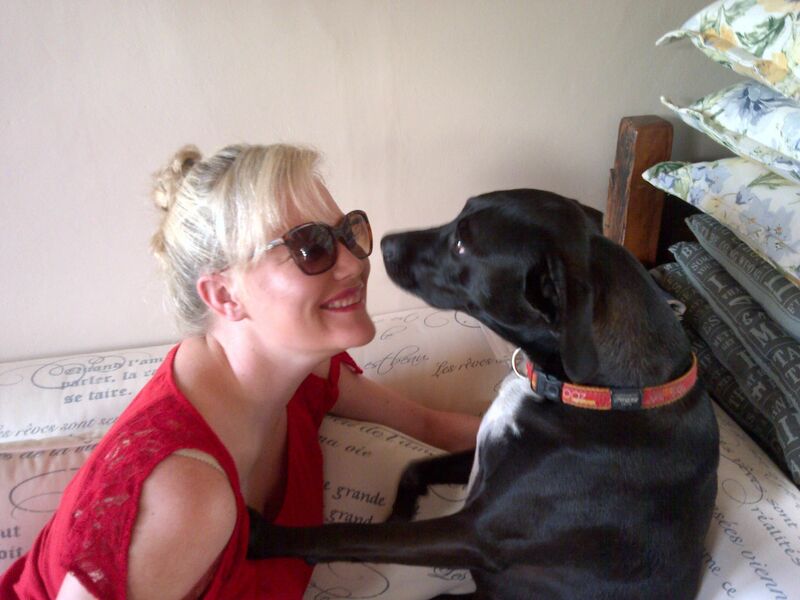 Dr Susan Van Niekerk also warned dog owners not to exercise their animals in the heat of the day. Should you wish to exercise your animals either take them early in the morning or late afternoon / early evening. “Keep an eye on your animals – if your dog pants excessively; becomes very lethargic or collapses – it could be suffering from heatstroke. Wet your animals and allow them to lay in a cool spot, dogs with flat noses, e.g. bull dogs, require extra care during the heat. 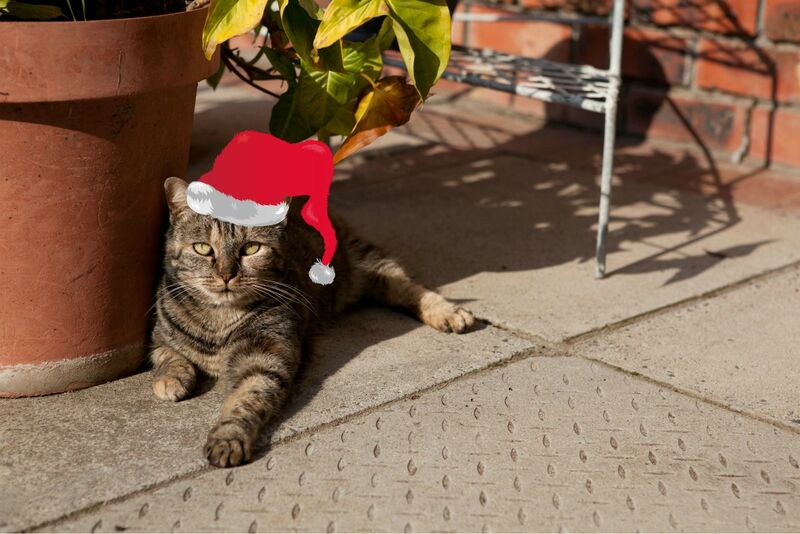 Should you go out during the day, do not leave your animals confined to a room that has full exposure to the sun, either leave them indoors with full access of the house or alternatively place them outside but ensure they have a shaded area to lie in. Dr Susan Van Niekerk has cautioned that corrugated metal will conduct the heat and become extremely hot and are therefore not suitable as shelters. ”Rabbits and other small pets kept outside in hutches should also always be kept in the shade”, said Dr Susan Van Niekerk. All caged animals – even if they are indoors – should not be left in direct sunlight. There are a lot more flies during the summer, picking up your pets feaces daily is important – as they attract flies and cause larva eggs to be laid – this can result in worms and the spread of parasitic diseases which are transferable to humans. The Animal Rescue Organisation is pleading with the public not to leave animals in cars. 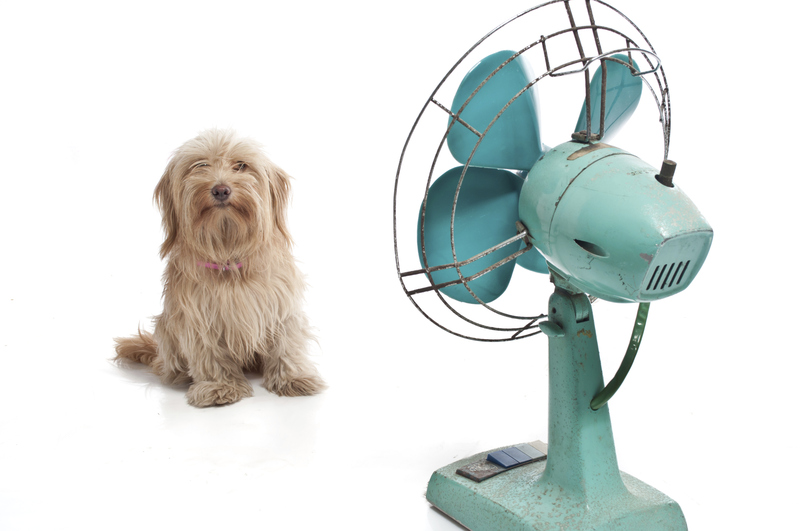 On hot days cars heat up extremely quickly and become like ovens and a pet could easily succumb to the effects of heat exposure, or even worse may die. If you come across an animal left in a car, try to locate the owner either through management at a shopping centre, or alternatively contact the nearest police station or animal organisation. For those of you living overseas, check out my blog on Winter Warming Tips. I look forward to hearing from you all, feel free to post photos of you and your pets enjoying the holiday season! Thank you Jani for a wonderful article. I couldn’t agree with you more! PETS ARE FOR LIFE, NOT FOR CHRISTMAS! Bella, one of our ARO office cats! It’s the season of giving, and while we all want to give gifts that are special and meaningful to our loved ones, especially children, a pet is not a gift. Although pets are cute and offer unconditional love, they also require a lifetime commitment from you, the owner! Many animals are handed in to shelters after the Christmas season is over. Many of these animals were given as gifts. Do not dump unwanted pets. Make a plan to reach a welfare shelter and sign the unwanted pet over correctly. Having discussed the realities of giving an animal as a gift, there are many other ways to assist our four legged friends. The Animal Rescue Organisation encourages the public to donate money to our organisation in lieu of a Christmas gift or alternatively visit our online shop www.animalrescue.org.za and purchase your Christmas presents with us, that way you will be supporting the animals in our care. For those who have researched and understand the commitments of caring for an animal, and still feel you would like to add a four legged companion to the Christmas celebrations, please visit a reputable welfare organisation and adopt one of the many animals in need of a good home. If you are already a pet owner, myself and the Animal Rescue Organisation are appealing to owners to be vigilant and responsible during the celebrations. Christmas trees and decorations add a touch of festivity and get everyone in the Christmas spirit, but for inquisitive pets its can be hazardous. Ensure the tree is secure and won’t topple over, put any electrical cables and lights out of reach. Discard of any wrapping paper, ribbons, bows and carrier bags as your pets could easily get entangled and injure themselves. Refrain from letting off firecrackers and be mindful when pulling Christmas crackers and popping champagne corks and balloons. Provide a safe quiet environment for your pet to go to should the celebrations or rowdy visitors become too much. Before sitting back and relaxing after a meal, ensure any leftovers are put away and are out of reach from your pet, turkey and chicken bones can splinter and become lodged in your pets throat or damage their intestine. Keep alcohol out of reach. Don’t be tempted to change your pets regular feeding habits, overfeeding or diet changes can cause digestive upsets. Should you wish to spoil your pet, rather choose to purchase a toy or treats, that are provide by a reputable vet shop. In the event, that your pet gets out of the property, ensure your pets has a means of identification. Last but not least, when on your travels, NEVER leave your pets in the car, especially not during the hot summer months. In closing, I wish all my fellow bloggers and followers a happy, healthy and safe festive season. May 2014 be a year of kindness and compassion to all animals. It is that time of year again, when fireworks and celebrations mark the start of the ‘silly season’. The Animal Rescue Organisation (ARO) is appealing to all Capetonians getting ready to celebrate Guy Fawkes, not to purchase or encourage the releasing of fireworks which can be harmful to animals and people, especially those that let off a bang. 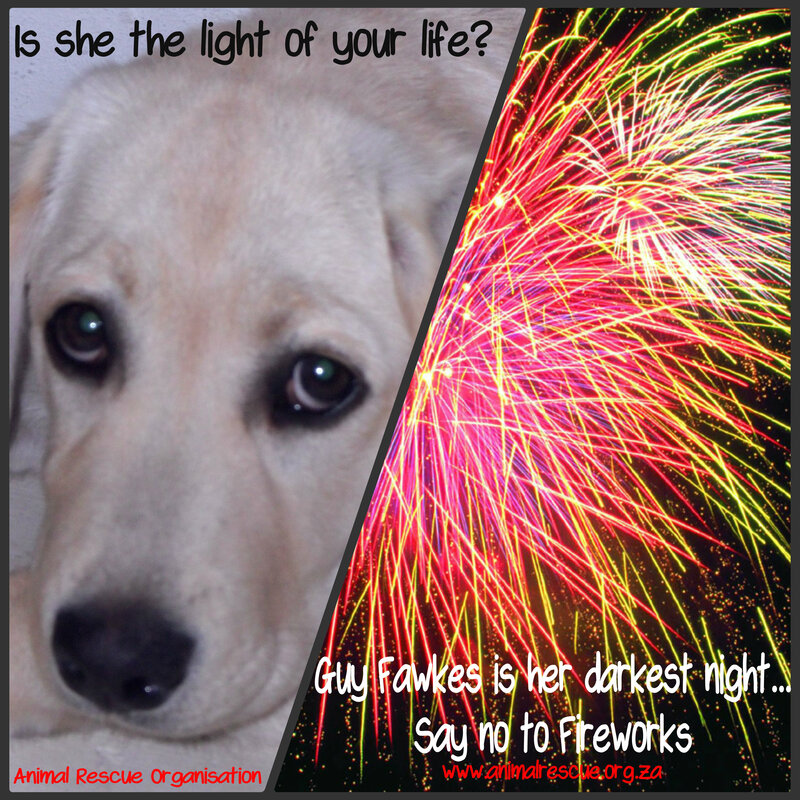 The Animal Rescue Organisation is against the use of any fireworks which give off a loud noise due to the fear and trauma that they cause to animals. An animal’s hearing is far more acute than that of ours enabling them to hear a wider range of sounds. With every firework let off an animal hears it at least seven times louder than that of humans. Their immediate reaction is to escape the noise often resulting in the animals causing severe injuries to themselves. Harming an animal is illegal and will result in prosecution. Should you suspect an animal is in danger, members of the public are urged to contact the Metro Police 24 hour call centre to lodge complaints regarding illegal firework activities on 021 596 1999 or the SPCA Inspectorate on 083 362 1604. If you suspect or know your pet reacts badly towards fireworks, seek professional advice and help from your veterinarian who may prescribe a sedative to help ease the symptoms. There are also a number of effective homeopathic remedies available at health shops and certain vet shops. The potential injuries which pets and people can sustain from fireworks are horrendous and just not worth the cheap thrill that a small minority enjoy at the expense of the majority. Although we are hopeful of an incident free Guy Fawkes, we are prepared for the worst. Fireworks are potentially dangerous, a waste of money and ought to be banned. Feel free to post your comments, I would love to hear your opinions and views. 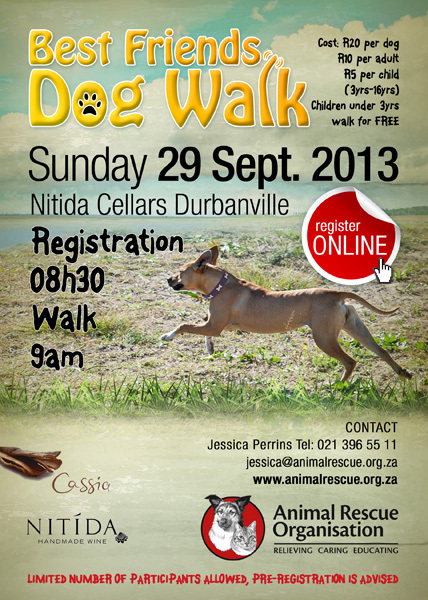 Great news for ARO supporters and dog walkers, we will be hosting another Best Friends Dog Walk this Sunday, 29 September 2013 at Nitida Wines in Durbanville. Enjoy a leisurely 2km stroll through the vineyards, or for the more adventurous try out the 4km route. Participants are advised to pre-register due to a limited number of participants allowed, register at http://www.animalrescue.org.za. Registration opens at 08h30 on the day and the walk starts at 09h00. The Cassia Restaurant on the estate will have delicious muffins and breakfast available on the morning. The ARO will have promotional goods and treats for your dogs on sale too! With the clouds clearing and Sunday promising to be a beautiful day, our Best Friends Dog Walk is the perfect way to beat the winter blues and enjoy the outdoors with your best friend. Please support EWN and the Cape of Good Hope SPCA on this very important matter. Feel free to share, like, tweet and comment on the topic. With the stormy weather we have had over the past weekend, it seems “silly” to announce the arrival of spring – but it is officially spring and I am sure that we will all soon be wishing for the odd cooler day. Especially those that enjoy the outdoors as much as the dog walking fraternity do. There is no excuse for not getting out and enjoying the fresh air, and if like me, you have pets that come rain or shine love the outdoors; they will be more than happy to accompany you. Kommetjie Lighthouse Boardwalk – Lighthouse Road, Kommetjie. Must be under control at all times. Noordhoek Common – Noordhoek main road and Avondrust Road, Noordhoek. Same conditions as above. Fish Hoek Beach – dogs are permitted to run freely on certain parts of the beach. Silvermine Dam – Situated on Ou Kaapse Weg, dogs are allowed in specified areas. Keep on a lead. Constantia Green Belt – Alphen Drive (opposite Alphen Hotel), Constantia. As above. Rondebosch Common – Park Road and Campground Road, Rondebosch. Keep under control at all times. Keurboom Park – Keurboom Road, Rondebosch. As above. De Waal Park – Upper Orange Road, Gardens, Cape Town +27 (0)21 400 2521. Keep under control at all times. If the weather (and other benefits) aren’t enough to persuade you, then consider doing your bit for a great cause and join the Animal Rescue Organisation on Sunday 29th September 2013 at the beautiful Nitida Wine Estate in Durbanville for their second Best Friends Dog Walk, for more information or to register online visit www.animalrescue.org.za. I look forward to seeing both you and your beloved dogs at this year’s Best Friends Dog Walk which has been described as one of the most relaxed and enjoyable around.